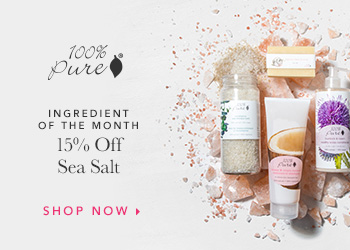 In recent years, there's been a huge rise in popularity when it comes to natural skin care use. And while a lot more brands are adapting to these needs, sometimes it can take time before you find the perfect products for you. Or, sometimes, you prefer to just make them yourself! 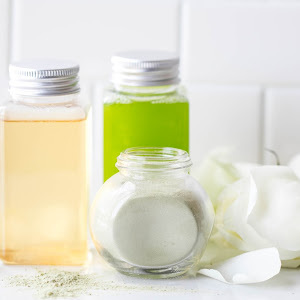 Today, I'm sharing three DIY natural skin care products that you can incorporate into your beauty routine in order to get that clear and glowing skin you've been lusting after. Of course, routines can vary from person to person - some people are comfortable with only washing their face with water before applying a simple moisturizer, then you have others who swear by more elaborate routines like the infamous 10 step korean skin care routine. I generally like to meet in the middle with a 4-5 step routine focusing on a face wash, exfoliation, toning and moisturizing. So without further delay, to learn how to make your own natural products, simply scroll down below to watch my YouTube video tutorial. 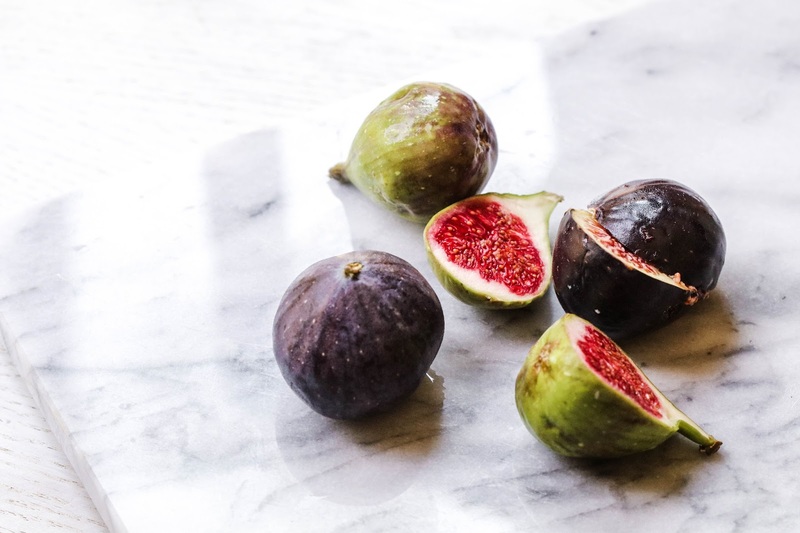 I recently opened up about my struggle with PCOS and weight gain, and while my weight had gotten the better of me for the last few years, I decided some months back to take back control and lose the weight for good! So far, I have lost near 40lbs on a low carb diet. I don’t have a specific diet that I refer to, but have simply cut back on refined carbohydrates, such as pasta, bread, and rice. I’m not going to lie, it’s been hard! Especially when I was starting out and had no idea how to conjure up a meal without including some form of starch. I have since learned that you can definitely enjoy delicious meals without pasta. 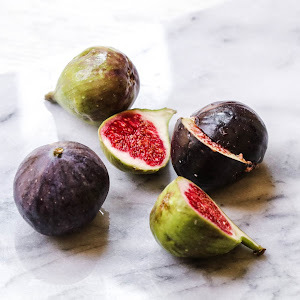 While I don’t eat these every single day (variety is key while on a diet), I wanted to share a few meal ideas as I take you along with me on this “What I Eat in A Day” post. Breakfast most definitely is the most important meal of the day! I used to constantly skip breakfast prior to getting on my weight loss journey, but have found that ever since I started making breakfast an essential part of my day, I’ve become a lot more productive, and it’s helped with the weight loss as well. I’ll generally start with two eggs in the morning - sometimes scrambled, other days boiled - and on this day, I decided to have what is now one of my favourite omelettes ever. 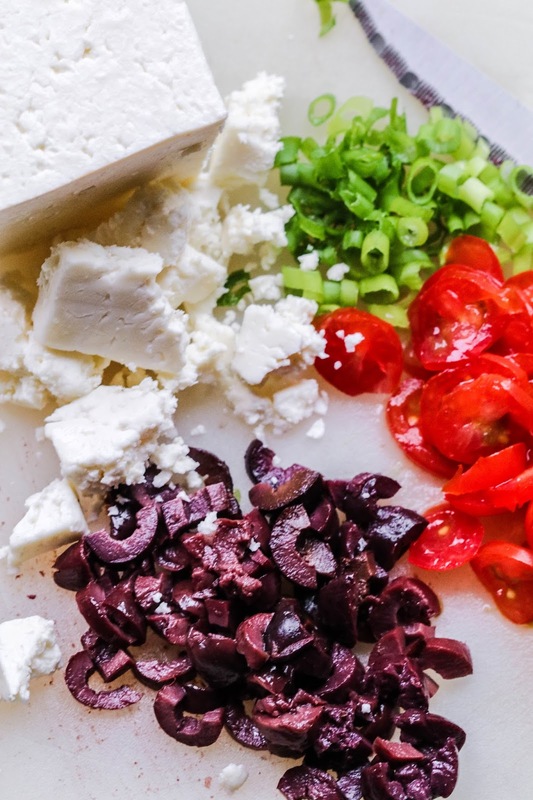 It’s a Mediterranean style omelette made with fresh kalamata olives, garden cherry tomatoes, spring onions, and crumbled feta. We’ve been doing a lot of grilling at home lately, and taking advantage of the remaining days of BBQ season. 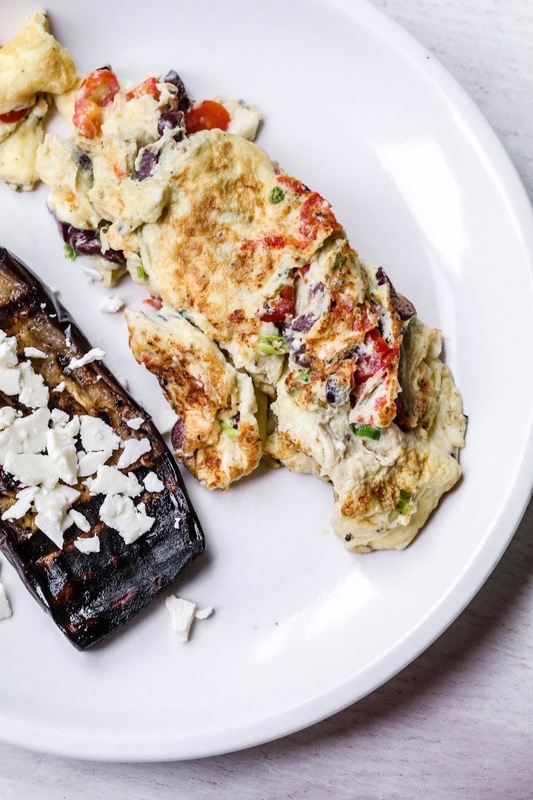 As a result, there’s been a lot of leftover grilled veggies in the fridge, so I took the liberty of pairing the already divine omelette with some grilled eggplant, and it was one of the best pairings ever. For lunch I decided to experiment with spaghetti squash for the first time. I’ve always heard about it being a great substitute for actual pasta, and I had been craving fettuccini alfredo for so long that it seemed like an ideal time to test out the squash. I made an alfredo sauce with garlic, onion, chicken breast, mushrooms, cream cheese, and water. 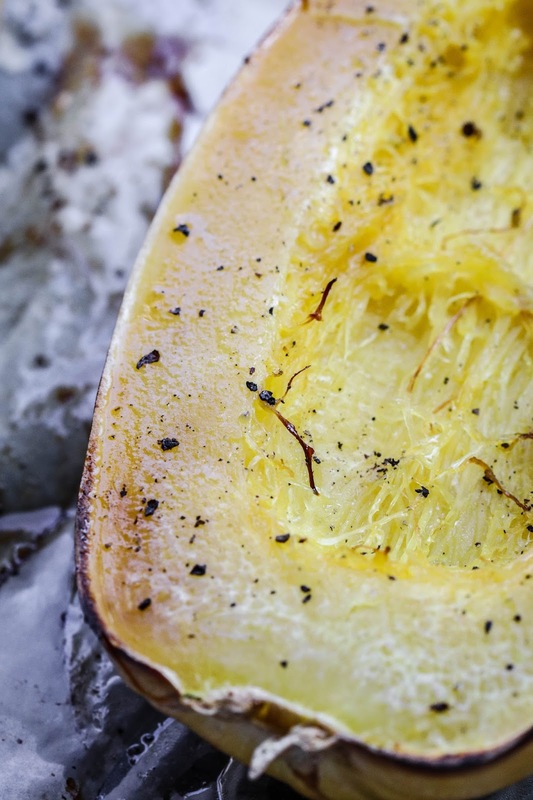 I cut the squash in half and let it roast in the oven for 30 minutes. 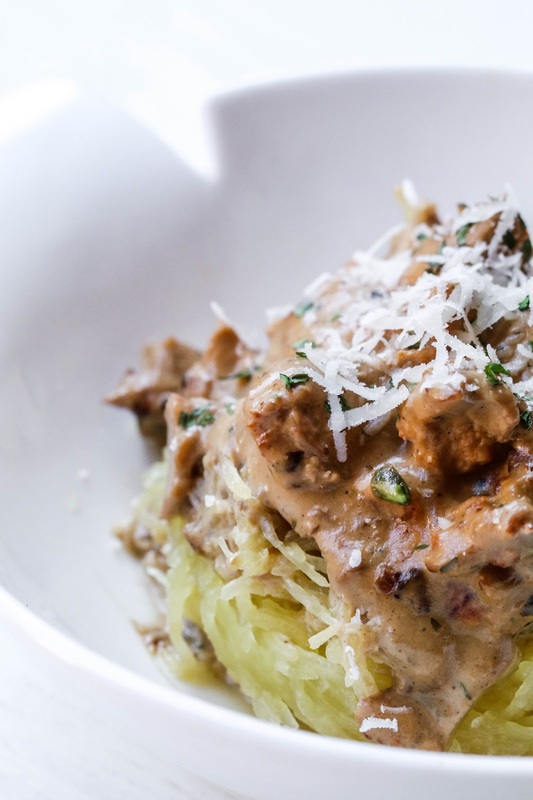 While the sauce was amazing, I’m not too sure how I feel about spaghetti squash overall just yet. It was a little too sweet for my taste, but I’ll have to give it another try some time soon! And finally there was dinner. I wasn’t too hungry that night so I decided to stick with something simple. 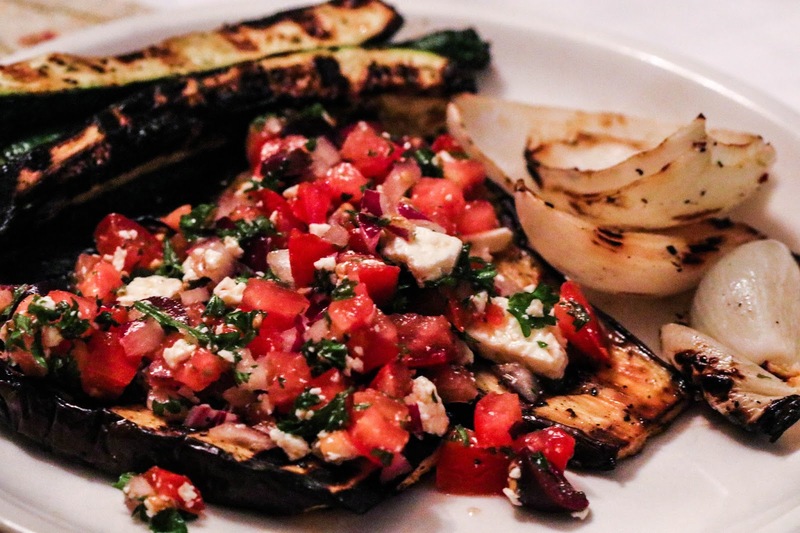 Some grilled zucchini, eggplant, onions, and a little greek salad to top it all off. It was a great light meal, but I was so full from the rest of the day that I didn’t even end up finishing half of my plate. If you’re ever not that hungry during dinnertime, I would definitely recommend sticking to a simple salad and some grilled veggies. It’s quick, easy, and won’t make you feel bloated afterwards. One of my latest beauty obsessions has been ice facial. They’ve been around for a long time, and many women swear by them, as they should! 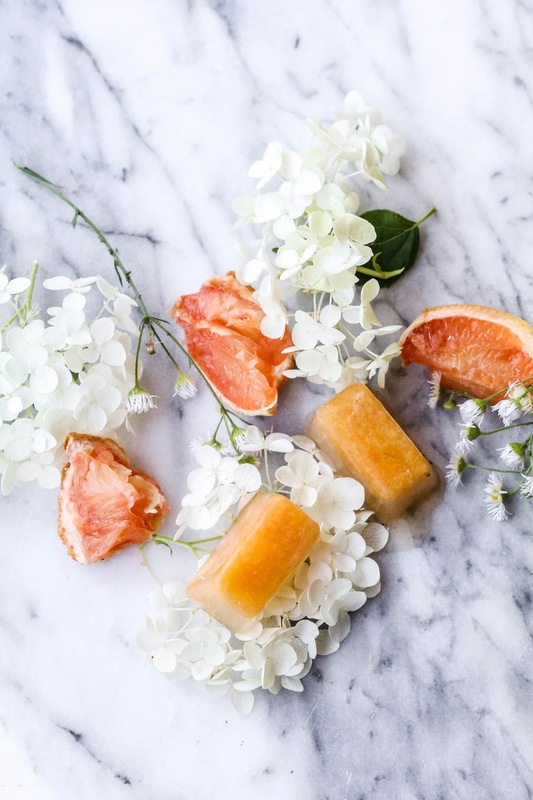 There is something so refreshing and luxurious about them, especially when you take that extra special little step to customize your ice cubes. 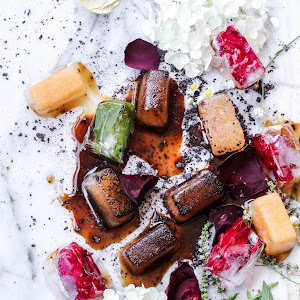 You then not only reap the original benefits of a classic ice facial, but in addition get to enjoy the wonderful qualities of whatever other ingredients you decided to add to create your own custom little drop of frozen ice cube heaven. 3. They can help shrink that un-timely zit you just happened to get! So there you have it. Five pretty great reasons for why ice facials are a new must for you. Have I convinced you yet? 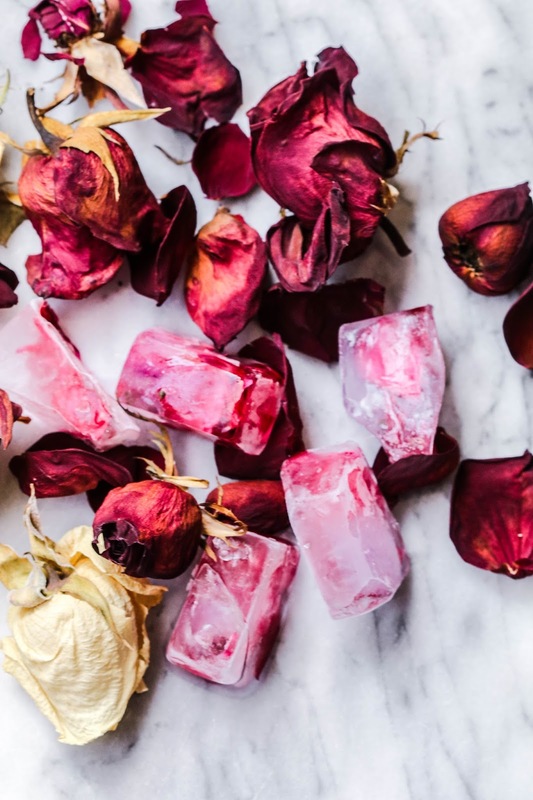 Well just in case that I have… in this post, I’m sharing FOUR different ways you can customize your ice facials and the benefits each one entails. 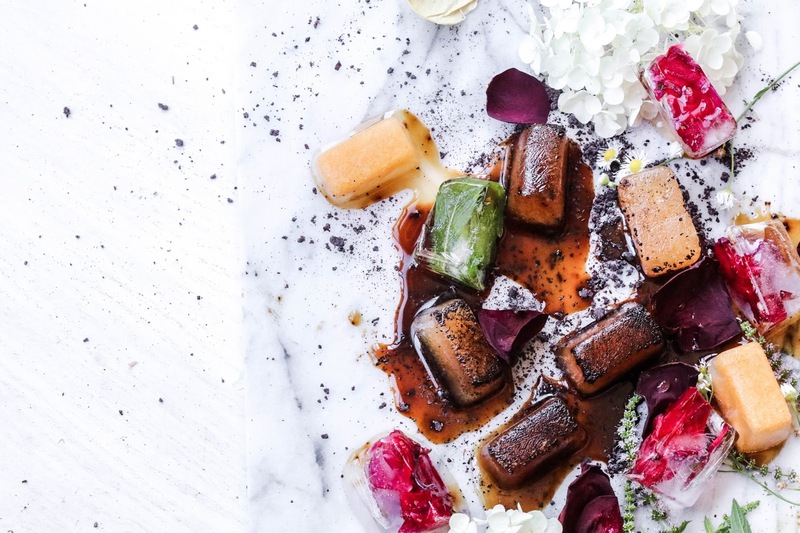 Roses have a tendency to add an instant dose of luxury to everything they touch, don’t they? Well, in addition to their enchanting floral scent, they also have many wonderful benefits for the skin. Roses are a great source of antioxidants in addition to containing anti-inflammatory properties. 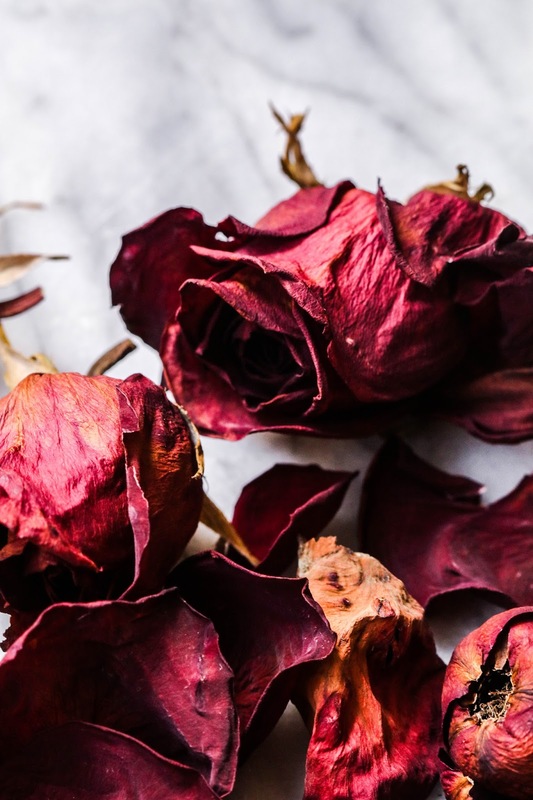 Finally, they have incredible toning properties and adding rose petals to your facial will help instantly tighten and give a healthy glow to your skin. This one is a great morning facial to opt for if you’re short on time but need to revitalize your skin quickly. 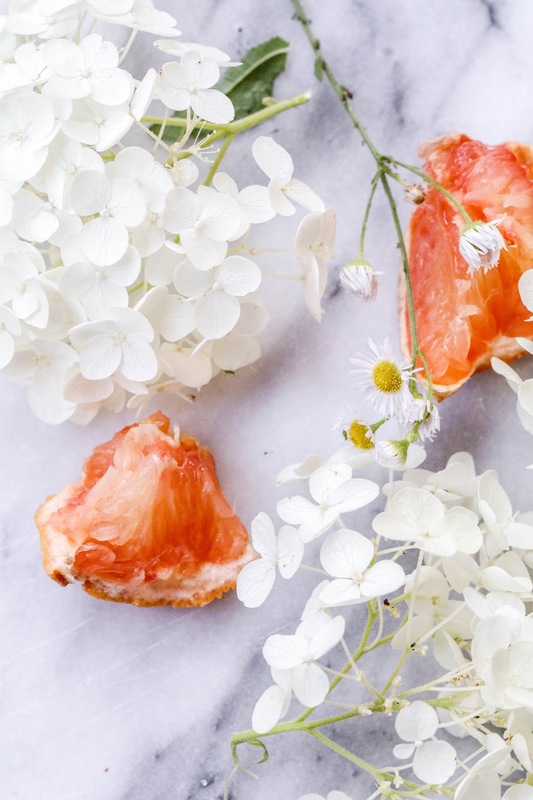 Citrus such as oranges and grapefruits are jam packed with vitamin C. When applied to the skin, vitamin C helps to instantly brighten dull skin, tone and improve signs of fatigue. However, be sure to always wear sunscreen (although you should always wear it) after applying any citrus based product on your skin if you’re heading out into the sun. 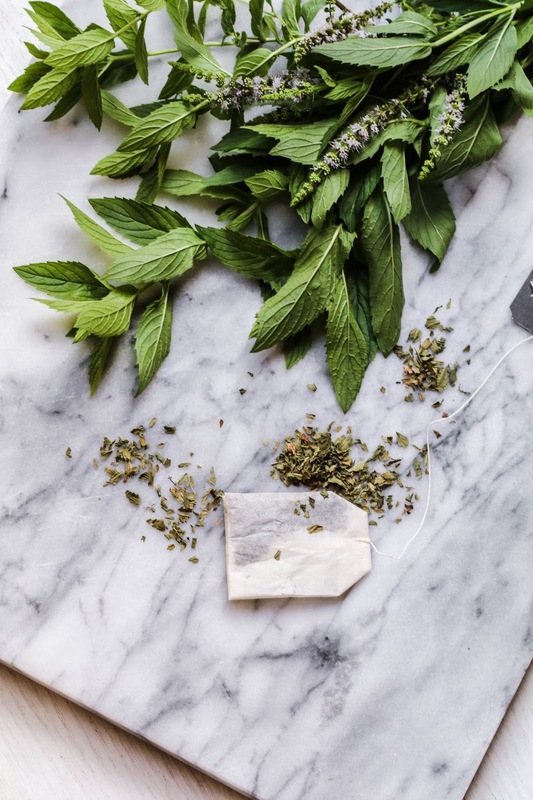 Everyone knows that green tea is an excellent tea to drink for dietary purposes, but have you ever tried any sort of mint tea? If not, then I highly recommend you try it! 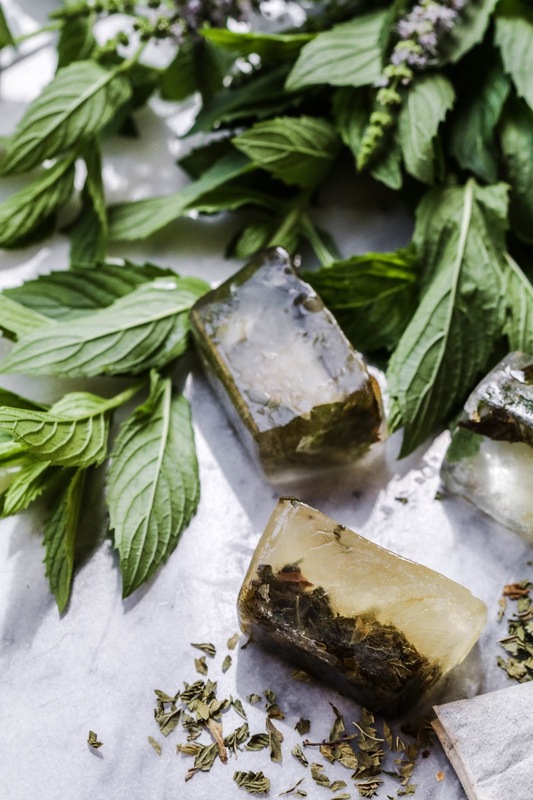 Mint is very refreshing and cooling and whether you’re applying it on the skin, or consuming it internally, you’ll notice that refreshing quality I’m talking about instantly. Another great benefit of adding mint to your facial? It’ll help treat acne. As for green tea, it’s very high in antioxidants and even contains caffeine (this helps with reducing any kind of puffiness or inflammation you may have on the skin). The cooling benefits of the mint mixed with the caffeine properties of the green tea, essentially make it for a great under eye treatment. Last but most definitely not least, coffee. Caffeine is the star of the show with this one. 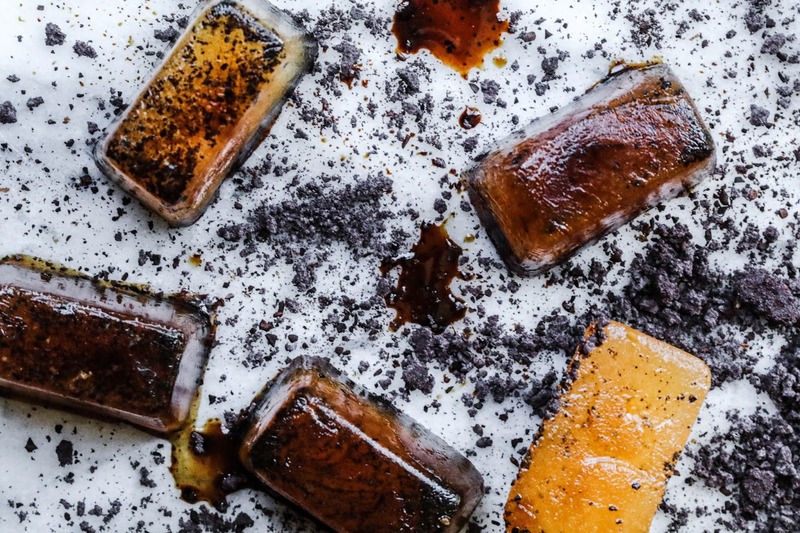 Pour some freshly brewed coffee into your ice moulds and sprinkle on some coffee granules on top before freezing. What you’ll have with is an incredibly stimulating and exfoliating ice facial that will scrub away the dead skin cells from the surface, help stimulate blood circulation, brighten and energize your skin. In the end, you’ll be left with a beautiful glow that will have you smiling all day! That’s it for the four custom options I have to share with you for today. Of course, there are limitless possibilities when it comes to customizing your ice facials and if you happen to create your own little gem formula, then please do share the pictures with me on social media by tagging me with #lookshyma. I’d love to see your spin on them! Feel free to let me know in the comments below too if you have any specific combination in mind. I’d love to hear from you! In the last few years, korean skin care’s popularity has exploded across the globe. I remember initially being introduced to it via the infamous BB cream. However, I didn’t get sucked in until a few months back, when the impressive 10+ step skin care regimen of Korean women began to go viral. I started watching their skincare routine videos religiously, being fascinated by how luxurious and pampering it all seemed. While I still don’t have a routine as in depth as theirs, I do try certain aspects of it every now and then. One thing that I have been loving lately are sheet masks. 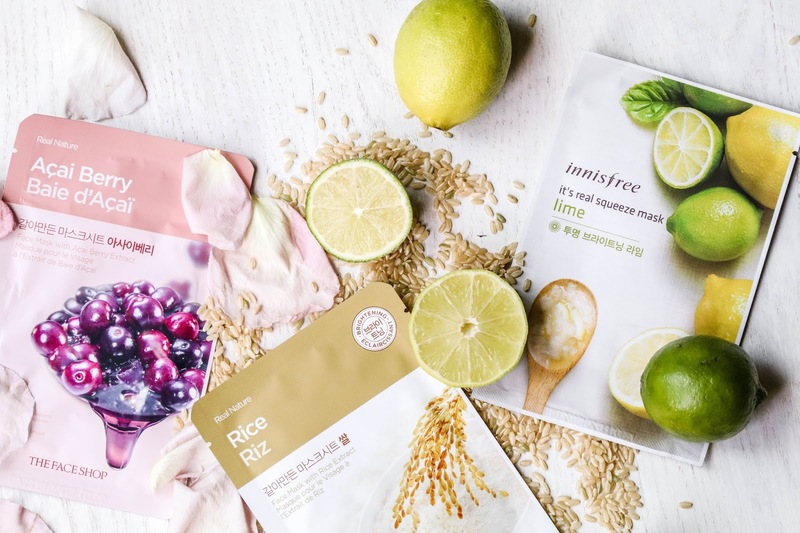 Sheet masks are great if you’re looking for a quick and simple way to elevate your skin care game and bring a little luxe into your life. They’re easy to use, mess free and feels incredible! You can go about your business while your skin is treated with the moisturizing essence from the mask and in the end you’ll be left with soft and dewy looking skin. While I enjoy experimenting with different brands, my two favourite Korean brands lately have been Innisfree and The Face Shop. There are several different types of sheet masks available, each catering to a different kind of skin care problem. 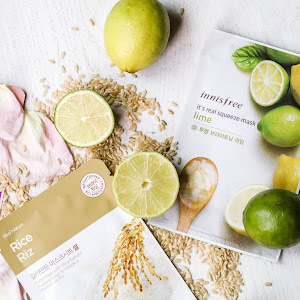 I immediately purchased the innisfree lime sheet masks following a read on a blog post I came across where the girl had experimented with using said sheet mask four days in a row. The results? Her skin was absolutely glowing! Now I was at school, supposed to be studying for finals, when I came across the post, but the results seemed so impressive, I took out my credit card and ordered them off of Amazon right then and there (because, priorities). It was a great purchase, because whenever I’m in the mood for a quick pamper session I apply one and 15 minutes later I’m left with the most incredibly dewy skin. 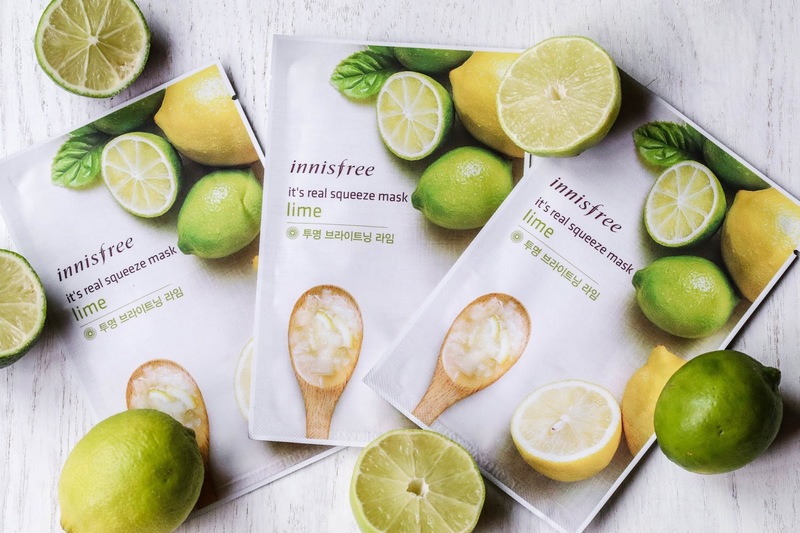 These sheet masks are laden with essence and definitely don’t disappoint! Have any of you guys experimented Korean skincare products yet? If so, which ones? 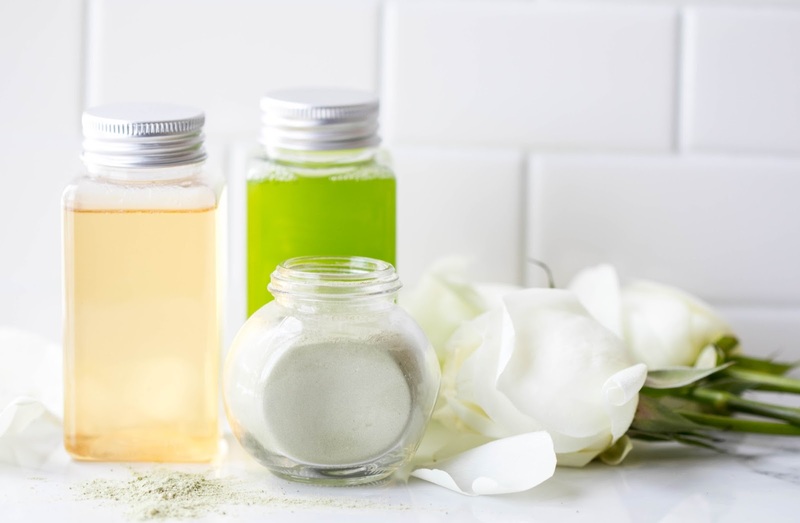 If there's anything specific that you use or any extra step you add to your skincare regimen for an extra pampering feel, I would love to hear about! © shyma. Design by Fearne.